Chris and Peter Dickson are convinced that every sixth-grader has the power to be a peacemaker. 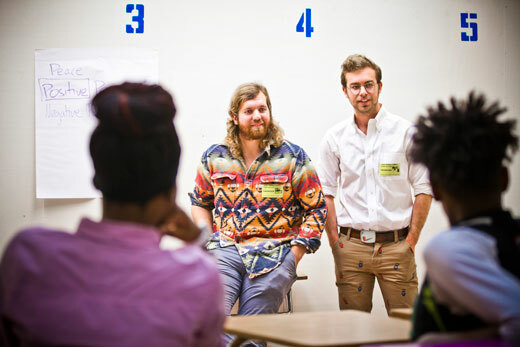 Each week the brothers, both students at Emory University, meet with a group of students at Martin Luther King Middle School to teach Kingian Nonviolence and conflict resolution. Chris, a second-year student at Emory's Candler School of Theology, is one half of the team. His younger brother Peter, a junior at Emory College of Arts and Sciences, is the other. Both matriculated at Emory's Oxford College. The session they lead is an extra-curricular club called "Kingian Nonviolence," part of school's After-School All-Stars Program. "It's hard to get a middle school student to sign up for a nonviolence club," says Peter. The session currently involves eight to 16 students, depending on the week, and their journey with the brothers had a rocky start. "We noticed at the beginning that the kids were focused on the negative," says Peter. "So we've been trying to say what's good about them and call out different qualities. A huge aspect of nonviolence is to acknowledge someone else. As we've acknowledged them, they've begun to acknowledge us." As the program has progressed, the students feel more comfortable sharing their opinions, hopes and fears with Chris and Peter. The two say they began breaking the ice by talking about their own conflicts within their family—and as brothers. "It makes it powerful when you talk about a person you've had a conflict with and invite people into ways we've resolved our conflicts," says Peter. "It made it interesting and something we didn't expect. If we can do this together, so can they." "We had them do conflict mapping," says Chris. "Everyone got to draw or write about some conflict from their own experience. Everyone has a story of conflict, their perception of conflict or violence. Not one of their papers was blank." The brothers stress that conflict isn't a bad thing; it's a normal thing. "So how do we view that in a positive way as a bright spot for change?" asks Chris. "We address that in the classroom and then look at how do we talk about these issues in a way that actually changes perception, and hopefully the culture." Chris' road to teaching peacemaking goes back four years, when he was a junior at Emory College of Arts and Sciences, the same year his brother Peter is now. Chris took a class with religion professor Bobbi Patterson and started doing community work in the garden at Coan Middle School. He also took a class and did Kingian Nonviolence training with civil rights icon and Candler distinguished senior scholar-in-residence Bernard Lafayette. Then his studies took over, and Chris put the idea aside—temporarily. Fast-forward three years. Returning to Emory as a student at Candler, Chris took a class in the Graduate Division of Religion, this time with Bobbi Patterson and Vialla Hartfield-Mendez, who were challenging students to follow their passions in community change. "Conflict resolution is something we're all engaged in whether we like it or not," says Chris. So when the opportunity came to combine Kingian Nonviolence training as part of his Contextual Education work at Candler, he jumped at the chance. Chris was able to split his Candler Con Ed work between Edgewood Church in East Atlanta and Graduation Generation's Kingian Nonviolence program at MLK Middle School. Meanwhile, Peter took a course in Kingian Nonviolence this past summer in order to team up with his brother in the fall. Chris and Peter's work is one of many initiatives of the Graduation Generation collaborative, a family-school-university-community partnership that includes Atlanta Public Schools, Emory's Center for Community Partnerships and Campus Life, and Communities in Schools Atlanta, working closely with the Zeist Foundation and more than a dozen other community and philanthropic organizations. "Before we met Chris, we heard his name in relation to Kingian Nonviolence work," says Barbara Coble, education partnership manager with Graduation Generation. "As we talked with him and learned about his passion and training, we thought he would be a great person to continue the work already begun with the program. Then, when Peter came to Emory from the Oxford campus, they teamed up." "Because the [middle school] students are so young, they don't have a lot of background on the civil rights movement," says Bevin Carpenter, community partnerships manager for Graduation Generation. Carpenter helped Chris and Peter bring the civil rights and Kingian Nonviolence into context for the students, from showing films about the era to having students do research on their family names and history. Chris and Peter plan to continue their work next year and perhaps beyond. Their goal is for the students to become leaders in conflict resolution and Kingian Nonviolence—to pass along what they've learned, to grow a movement. Coincidentally, Chris and Peter's mother Susane Dickson recently relocated to Atlanta and Emory from the family's home in Miami to complete a medical residency in psychiatry. "I honestly never imagined it would work this way," she says of the matching process that placed her at same university as her two sons. "We have a lot of faith; there's a lot of things we don't understand. Things work out and we're blessed by it." She echoes Chris and Peter's conviction that changing your community requires changing yourself. "It starts with us, as individuals, to be able to get along and get together," she says. "For two brothers to embrace that, I'm excited about them being an example." Susane says her sons love people. She recalls Peter as a high school student befriending a homeless man by playing tennis with him regularly. The man ended up getting a job, moving on with his life. "They've seen transformation when you take an interest and show compassion," Susane says. "They want to continue that, and I'm proud of them."